Apple announced updated iPad Pro and Macs today that are more powerful, thinner, and lighter. But along with all the advancements come more expensive prices. While the new tablet starts at $800, a maxed out iPad Pro costs almost $2,000 and that’s without any accessories. The new MacBook Air and Mac mini also become quite expensive with upgrades, going north of $2,500 and $4,000, respectively. The new 11- and 12.9-inch iPad Pro models start at $150 and $200 dollars more expensive, respectively, than last year’s lineup. The base model 11-inch iPad Pro with Wi-Fi costs $800 with 64GB of storage, while the 12.9-inch Wi-Fi version runs $1,000. 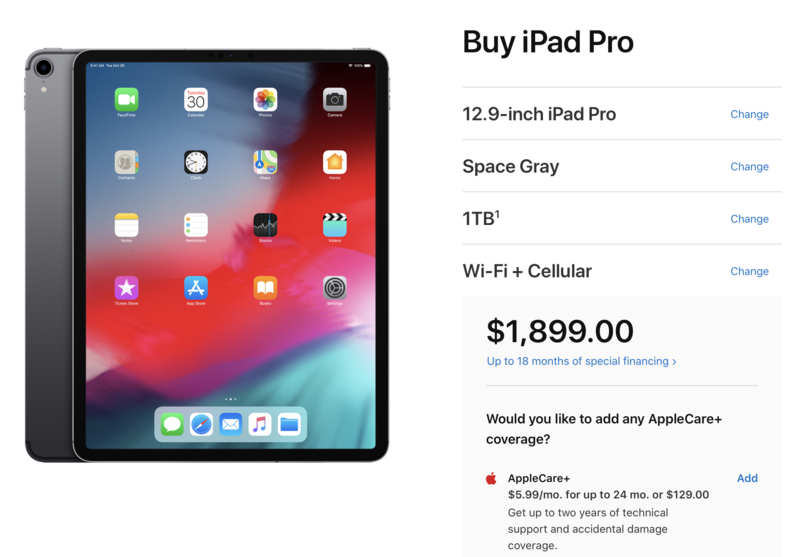 For those adding 1TB of storage with the cellular model, the maxed out iPad Pro prices almost double to $1,699 for the 11-inch and $1,899 for the 12.9-inch. Add in a Smart Folio or Smart Keyboard Folio, the new Apple Pencil, AppleCare+, and tax and you’re looking at around $2,200-$2,600. While the MacBook Air has long been Apple’s budget notebook, today’s improvements to the newest model also means a higher price. Previously starting at $999, the 2018 MacBook Air includes a $200 price hike that puts it at $1,199. But if you opt for 16GB RAM and the 1.5TB SSD and you’re now looking at a price in the MacBook Pro range of $2,600. Lastly, the Mac mini received its highly anticipated update today. The new models offer four or six-core processors and can really be upgraded across the board. The base model starts out at $800, but quickly climbs to $4,200 with the 6-core Intel i7 processor, 64GB RAM, 2TB SSD, and 10 Gigabit Ethernet upgrade. After the iPhone XS and XS Max became the company’s most expensive iPhones to date, these latest iPad and Macs have followed suit. What about you? Do you think the base models are sufficient the for the iPad Pros and Macs, or is Apple expecting most users to buy upgraded machines? Keep up with all of today’s announcements with our October Event news hub. Launched in 2005 as the first sub-$500 Mac — a key in attracting "switchers" from Windows PCs — the Mac mini (now $799 and up from the Apple Store) was most recently redesigned in late 2018.